Welcome to our Fortnite Constructor Class Guide, here you can view Abilities, Weapons and this Heroes Skill Tree. The Constructor Class is the base builder, and most Minecraft and other base building gamers will feel right at home with this class. B.A.S.E Deploys a large holographic cube in the environment; anything built inside it costs fewer resources for the constructor. Pre-Planning Makes structures built by the constructor stronger. Containment Unit Deals persistent damage to enemies within the B.A.S.E. area. Plasma Pulse Area-of-effect grenades that deal damage for a short period of time. 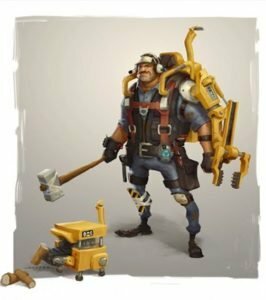 Even though the Constructor Class in fortnite main focus is building a strong base/fort. You can still use guns and other weapons/abilities to help your team with the onslaught of incoming enemies trying to destroy your base. The Constructor Skill Tree is currently a work in progress till the game is released. Here you can view the other 3 Classes Available in Fortnite.